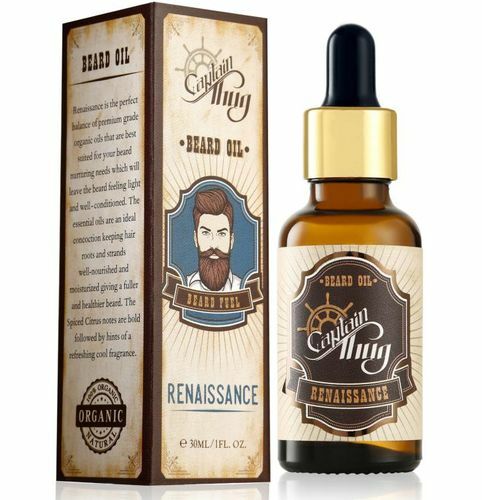 Captain Thug's Ultra Premium & All Natural Renaissance Beard Oil is the perfect balance of premium grade organic oils that are best suited for your beard nurturing needs which will leave the beard feeling light and well- conditioned. The essential oils are an ideal concoction keeping hair roots and strands well-nourished and moisturized giving a fuller and healthier beard. The Spiced Citrus notes are bold followed by hints of a refreshing cool fragrance. Additional Information: Captain Thug brand is known for making luxurious grooming products for men using premium all natural essential oils, carrier oils and growth stimulating ingredients. With over 40+ years of experience, their products soothe, moisturize and invigorate both skin and facial hair. Inspired by the urban lifestyle, their products are built to keep your beard looking good no matter where your adventures take you. Explore the entire range of Beard & Moustache Care available on Nykaa. Shop more Captain Thug products here.You can browse through the complete world of Captain Thug Beard & Moustache Care .